Some ground stone tools are incidental, caused by use with other tools: manos, for example, are hand stones used in conjunction with metates and other grinding slabs (querns), and develop their ground surfaces through wear. 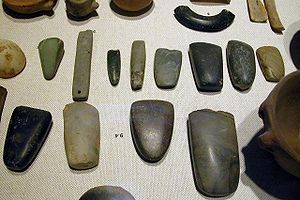 Other ground stone tools include adzes, celts, and axes, which are manufactured using a labor-intensive, time-consuming method of repeated grinding against a harder stone or with sand, often using water as a lubricant. These tools are often made using durable finer-grained materials rather than coarse materials. In the North American arctic, tools made of ground slate were used by the Norton, Dorset, and Thule tool cultures, among others. Common forms of these tools were projectile points and ulus. These tools were often purpose-made by creating a blank, either by chipping or using a technique where the slate was sawed partway through on one or both sides and then snapped into a blank, then finished by grinding with abraders or whetstones. 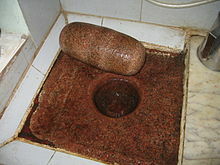 Ground stones were often used as dinner-ware. Using large stones, lithic reduction would be done for long periods of time to create bowls and pots for food. Jewelry, beads, ear spools and other decorative ground stones were a sign of high status due to the time and effort needed to make pieces of such small size and detail. ^ Clark, Donald W. (1982). "An Example of Technological Change in Prehistory: The Origin of a Regional Ground Slate Industry in South-Central Coastal Alaska". Arctic Anthropology. 19 (1): 103–125. JSTOR 40316018.